Start off next school year stylish with this 36 pack of backpacks. Perfect for back-to-school drives or promotional products; this multi-pack is convenient for businesses or non-profit groups such as charities, churches, schools, or government agencies. cost-effective solution for projects that require a large quantity of backpacks, allowing you to stretch your budget. This 15" wholesale kids backpack comes in classic black. Equipped with adjustable padded straps, a large main compartment with dual zipper, and easy grip handle, this is the perfect backpack for all your back to school needs. Comes in a case of 36. 36 VALUE PACK - Why buy retail when you can buy wholesale? Get the most out of your budget by purchasing 36 backpacks for one low price. PROMO GIVEAWAYS - Perfect for back-to-school drives or as promotional products; this multi-pack is convenient for businesses or non-profit groups such as charities, churches, schools, or government agencies. CLASSIC DESIGN - A clean timeless design that is sure to remain in style, the backpack features a main zipper compartment that is equipped with an overlapping zipper cover, and convenient front zipper pocket. STANDARD 15" - This backpack's standard frame makes it perfect for elementary school students with plenty of room for textbooks, notebooks, and supplies. Adjustable padded straps accommodate a wide range of ages. COLOR - This backpack comes in a bulk case of 36 black backpacks. Perfect for boys or girls. 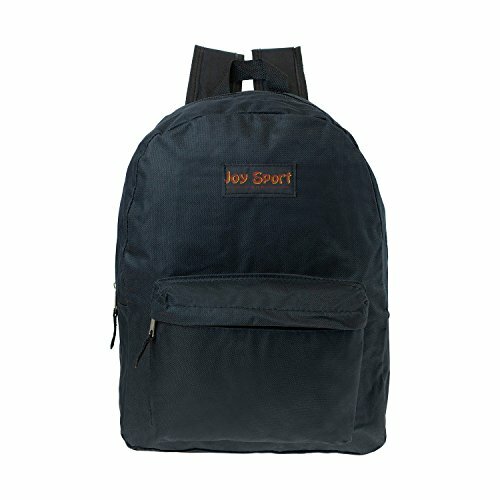 If you have any questions about this product by Joy Sport, contact us by completing and submitting the form below. If you are looking for a specif part number, please include it with your message.